Diego María Rivera (1886-1957) is one of the most prominent Mexican artists of the twentieth century. He gained international acclaim as a leader of the Mexican mural movement that sought to bring art to the masses through large-scale works on public walls. In his murals of the 1920s and 1930s Rivera developed a new, modern imagery to express Mexican national identity, which featured stylized representations of the working classes and indigenous cultures and espoused revolutionary ideals. This exhibition highlights Rivera's early foray into cubism, a less known but profoundly important aspect of the artist's development, in which his interest in themes of nationalism and politics first emerges. Featuring twenty-one works created in France and Spain between 1913 and 1915, the selection celebrates the National Gallery's No. 9, Spanish Still Life, 1915, recently bequeathed by Katharine Graham. During his time abroad, Rivera drew upon the radical innovations of cubism, inaugurated a few years earlier by Pablo Picasso and Georges Braque. Rivera adopted their dramatic fracturing of form, use of multiple perspective points, and flattening of the picture plane, and also borrowed favorite cubist motifs, such as liqueur bottles, musical instruments, and painted wood grain. Yet Rivera's cubism is formally and thematically distinctive. Characterized by brighter colors and a larger scale than many early cubist pictures, his work also features highly textured surfaces executed in a variety of techniques. The paintings on view, produced during a period that coincided with both the Mexican Revolution and World War I, reflect Rivera's expatriate role and explore issues of national identity. Many incorporate souvenirs of Mexico from afar and are infused with revolutionary sympathy and nostalgia. But these references to his native land are often embedded within canvases that refer to new Spanish, French, or Russian allegiances. Images © 2004 Banco de México Diego Rivera & Frida Kahlo Museums Trust, Av. Cinco de Mayo No. 2, Col. Centro, Del. Cuauhtémoc 06059, México, D.F. Diego Rivera was born in Guanajuato, Mexico, in December 1886, and moved with his family to Mexico City in the early 1890s. Rivera's parents, both educators, were part of the Europeanized professional classes that emerged under the Porfiriato, the lengthy dictatorial regime of President Porfirio Díaz. His prodigious talent was recognized at an early age, and by twelve he was enrolled in the national school of fine arts. Upon completion of his degree, Rivera was awarded a governmental stipend to further his career in art by traveling to Europe. With these funds, he sailed for Spain in January 1907. Remaining in Madrid for more than two years, Rivera studied with the Spanish academic painter Eduardo Chicharro, while assiduously copying from the collections of the Museo del Prado, and over time becoming part of the city's bohemian avant-garde. In 1909 Rivera embarked on an itinerary of art study in Europe that included visits to Paris, London, and Belgium. In Bruges he met the Russian painter Angelina Beloff, who soon became his companion and common-law wife, and together they moved to Paris. (The two remained a couple until Rivera departed for Mexico in 1921. He married the Mexican painter Frida Kahlo in 1929.) Rivera returned to Mexico for a one-man exhibition of his work that opened on November 20, 1910, a date notorious for its association with the start of the Mexican Revolution. Shortly after the December 20 close of his exhibition, Rivera again departed for Europe; it would be more than a decade--and following the end of the Revolution--before he returned to Mexico. Years later, embarrassed by his lack of revolutionary credentials, the artist claimed to have participated in the fighting, boasting that he had joined Emiliano Zapata's peasant forces and even plotted to kill President Díaz. In truth, Rivera and Beloff spent the next few years working in Spain and France, engaged with neither the strife in Mexico nor with the cubist revolution in art that had been initiated by Picasso and Braque. As his close friend and the subject of Portrait of Martín Luis Guzmán would write, Rivera "arrived calmly and late" to cubism. The commanding fall 1913 painting of fellow Mexican artist Adolfo Best Maugard with a view of the Gare Montparnasse from Rivera's studio can be considered as much an homage to his new home as a portrait of his friend. Maugard is pictured as a strikingly elegant figure, shown gesturing to the Great Ferris Wheel, which was built in 1900 for the Paris World's Fair. The wheel seems to rotate around Maugard's gloved hand; below the sweep of his coat follows the movement of a train rendered in a series of static planes. In situating his friend as integrally related to and yet distanced from these emblems of Paris, Rivera offers a meditation on their common identity as expatriates--at once part of and removed from the place in which they live. The expression of geographical displacement and multiple allegiances would be enduring themes in Rivera's work of the period. Shortly before the portrait was executed, Maugard visited the Spanish city of Toledo with Rivera and wrote of their admiration of the works of El Greco there. He noted that the sixteenth-century master's influence was strongly felt in Rivera's recent paintings, "especially his series of women with water jugs and landscapes with dramatic skys." The Woman at the Well of later that year--with the expressive pathos of the woman, her simplified drapery, and the stylization of her weighty curving form (which rhymes with the jar and the well)--also subtly recalls El Greco. Painted in Paris, the work thus intimates Rivera's reminiscences of the Moorish-Gothic city. In The Woman at the Well the artist incorporates a colorful bird form, suggestively Mesoamerican in appearance, which serves as a reminder of Mexico within this Spanish scene. This choice was perhaps influenced by his friend Maugard, who was documenting Mexican archaeological objects in Paris museums. The earthenware jugs, which became a favorite motif in Rivera's Toledan paintings, resemble ancient Mexican ones; for Rivera the similarity may have forged a resonant link between the Spanish city and his homeland. Memory operates as an underlying theme in other ways too: the woman and her water jar are rendered in sequential planes that suggest the passage of time. This synthesis of seen and remembered elements suggests Rivera's absorption of the philosophies of Henri Bergson, which were popular among the avant-garde in the early twentieth century. According to Bergson, individual consciousness is a melding of sensory perception, memories of the past, and anticipation of the future. Thus, there is no objective reality, only subjective understanding filtered through our experiences. Rivera's interest in themes of memory and experience is revealed in his personal interpretation of cubism. By 1913 Rivera had fully embraced the pictorial language of cubism in canvases such as Still Life with Balalaika. Here the artist imbued familiar cubist motifs--a bottle and a musical instrument--with deeply personal resonance. The Spanish liqueur Anís del Mono, for example, alludes to Rivera's recent stay in Toledo. The distinctive faceted bottle also calls to mind the work of renowned Spaniards Picasso and fellow cubist Juan Gris, who similarly had included the Spanish liqueur bottle in their cubist works. Rivera's inclusion of a Russian balalaika evokes his Russian companion, Angelina Beloff, and their joint studio space where the three-stringed instruments were displayed, while the floral pattern is drawn from their studio curtains. Rivera's relationship with Beloff, and her involvement with a circle of Russian anarchists, played a significant role in developing the artist's political and national consciousness. This burgeoning awareness was furthered by the deteriorating political situation in both Europe and Mexico. Many of the symbolic objects Rivera included in paintings of that time have nationalistic overtones. Serapes, the woven blankets worn by Mexican peasants, became a hallmark of the artist's cubist paintings. They were employed to powerful effect in the 1914 portrait of sculptor Jacques Lipchitz, where their vivid patterns vitalize the composition and cloak his Lithuanian friend in Rivera's Mexican identity. Yet Rivera often drew upon multiple references. In this portrait, he looks not only to traditional Mexican art, but also to the European avant-garde. The otherwise near-monochromatic palette and gridded compositional structure are profoundly redolent of work by Piet Mondrian, who had begun to include grid structures in his paintings of trees and other subjects. In deliberately quoting his neighbor's formal devices, Rivera incorporates an evocative memento of their exchange of ideas and artistic experiences. In spring 1914 the Chilean painter Ortiz de Zárate arrived at Rivera's studio with the directive, "Picasso sent me to tell you that if you don't go to see him, he's coming to see you." Rivera had ornamented his studio walls with reproductions of the Spanish artist's works and referred to him as "mi maestro"; the two quickly became friends. A painting that may have been inspired by Rivera's studio visits is Sailor at Lunch, which recalls a cubist painting by Picasso of a similarly mustachioed student reading a newspaper. Like many cubist works executed on the eve of World War I, Sailor at Lunch reflects the rising tide of French nationalism. Rivera's geometrized sailor--in the process of taking a drink at a wood-grain café table--wears a prominent cap with an oversized crimson pompom as part of his uniform, emblazoned with the word "patrie" (homeland). Rivera's reference to France and its navy undoubtedly alluded to his loyalty to that country. Yet the term "patrie" not only invokes French patriotism, but also poignantly recalls Rivera's own homeland, from which he was so far removed. In the summer of 1914, as the European political situation was reaching a crisis point, Rivera, Beloff, Lipchitz, and several other artists and writers traveled to the Balearic Islands off the Spanish coast for a walking and sketching tour. While executing naturalistic landscapes, Rivera also, as he would write, "continued my experiments with Cubism. I had attempted to achieve new textures and tactile effects by mixing substances like sand and sawdust in oils." These tangible surfaces illustrate Rivera's apparent pursuit of a Bergsonian premise: that experience is filtered through memory and sense perception, with the two interrelated. While Rivera and his friends were in Mallorca, the largest of the islands, their sojourn was dramatically interrupted by the news of the eruption of World War I. Rather than return immediately to France, Rivera and Beloff remained in neutral Spain, traveling to Barcelona and from there to Madrid. There Rivera became reacquainted with the Spanish writer Ramón Gómez de la Serna, as well as fellow Mexican expatriates, including the architect Jesús Acevedo and the writer Alfonso Reyes. Rivera also became a central figure of a larger, international artistic community transported from Montparnasse to Madrid, and he openly proclaimed his patriotism for France during the period. As Reyes wrote, "Rivera was all fired up for getting back to France and going to war." The artist later told of attempting to enlist several times, only to be rejected by the French army. Though a notoriously unreliable narrator, Rivera may have in fact been truthful in his account, for he had flat feet and his weight, at times, exceeded three hundred pounds. The painted record of his patriotic fervor, a work entitled Eiffel Tower, was executed in Spain in November 1914. Rivera's innovative composition highlights the Eiffel Tower, merging its structure with the Great Wheel. The preeminent emblem of Paris, the tower was also an appropriate symbol for France during the conflict, as it functioned as a radio transmitter and flashed electric light in the blue, white, and red of the French tricolor. In Rivera's painting, these symbolic colors appear in the background at right and are repeated in a flag-like form just below the wheel and tower, which in contrast are rendered ghostly pale. The ethereal forms of these icons of Parisian modernity intimate Rivera's distance from the city. Characteristically, Rivera was not content with simply creating an homage to his adopted homeland, but added another banner on a building at lower right that echoes the Mexican national colors of green, white, and red. Rivera shared an interest in cultural nationalism with his boyhood friend Jesús T. Acevedo, whom the artist painted in early 1915. Acevedo--an architect and art critic in political exile in Madrid--discussed at length with Rivera the question of whether Mexican art could intrinsically communicate its identity. They were also committed to creating works that were both Mexican and modern, as is evident in The Architect (Jesús T. Acevedo), in which the subject is presented as both. Perhaps in reference to his subject's occupation, it is a study in precision, the overall trapezoidal structure of Acevedo's face and head itself constructed through a sequence of geometric forms. Here, Rivera subtly specifies the Mexicanidad of both sitter and artist through Acevedo's attire, composed from a palette based on the green, white, and red of the Mexican flag. Pictorial devices often repeat from one painting to the next, creating a close harmony of form between Rivera's portraits and still-life paintings. The representation of Acevedo neatly parallels perhaps the most complex of all Rivera's cubist still-lifes, No. 9, Spanish Still Life. In addition to the simulated wood-grain table and tiled floor, the paintings share a vortex of shifting planes, with solid, transparent, and ghost forms that whirl around a central element. In this case, the earthenware vessel receives particular emphasis: its heavily worked surface calls to mind not only the tangible presence of the jar but the substance of which it is made. Its form conjures Rivera's earlier Toledan representations of women with water jars, and it appears here as a distilled emblem of Spain. For Rivera, however, memories of place were not isolated. Within this Spanish still life appear three long, pointed molinillos--a familiar Mexican utensil used to grind cacao beans and whip the traditional drink chocolate de agua, which was brought to Spain by the conquistadors in the sixteenth century. The inclusion of a domestic Mexican object within a Spanish still life serves as a reference to home from afar, as well as a reminder of the exportation of ancient Mexican customs to Spain. When Rivera returned to Paris in late March 1915, he found a city radically changed by the onset of war. As Paris itself was only seventy-five miles from the front lines, the streets were routinely filled with soldiers, and those men not in uniform were met with curfews, suspicion, and in some cases, open hostility. The artistic community in Montparnasse had dispersed. Braque and Apollinaire were among the many artists now in the trenches, while others had decamped to neutral zones to avoid conscription. Salons were suspended, numerous galleries were closed, and buyers were scarce. This was a period of great hardship for many of the artists who remained in the city, including Rivera and Beloff. Still Life (Mallorca) was produced in Paris in such a climate, from studies made during Rivera's trip to the Balearic Islands. This luminous work invokes memories of the halcyon days before the war began. The artist has employed sand to palpably suggest the dazzling Mallorcan beaches, particularly as the still-life composition is surrounded by brilliant blue sky and turquoise water. 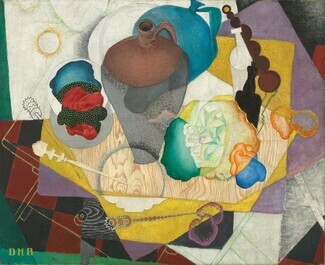 The indeterminate space, suggesting equally an interior scene and a landscape, was a novel pictorial device employed by Rivera in a number of works from this year, including Still Life with Gray Bowl. Another tabletop still life executed in Paris that year, The Café Terrace, almost certainly designates La Rotonde, the café so renowned for its sunny terrace that it was nicknamed "Raspail beach," after the Parisian boulevard on which it was located. Its tables--which resembled this one--were consistently popular with artists, not least because its owner accepted paintings as payment for meals. The Café Terrace features a decanter filled with brilliant green liquid, suggesting absinthe, the potent liqueur that was prepared with water poured over sugar through a slotted spoon. Though banned early in the twentieth century, it was famously consumed and depicted by Henri de Toulouse-Lautrec, Edgar Degas, Édouard Manet, and Picasso; here, it signifies the bohemian culture of Paris lost with the onset of war. A particularly prescient and jarring element underscores the wartime context--the pattern suggesting camouflage in the central swathe of the table. Camouflage, invented in the early days of World War I, was developed by artists, including avant-garde artists whom Rivera knew. This composition, pervaded by the colors green, white, and red, also bears witness to Rivera's primary allegiance to Mexico and reflects his concerns regarding the political climate there. An open cigar box on the right side of the composition contains a landscape in miniature and a label that reads "Benito Jua." The allusion is to Benito Juárez, the nineteenth-century indigenous revolutionary, reform leader, and first president of republican Mexico, who was a powerful symbol in relation to contemporary events. Over the course of 1915, Rivera's comprehension of the dire situation in Mexico was significantly heightened by visits from Martín Luis Guzmán, a journalist who had spent a year with Pancho Villa's guerrilla army and was exiled in Spain. In Rivera's Portrait of Martín Luis Guzmán, painted in Paris that year, Mexican iconography is utilized to compelling effect. Rivera highlights the writer's Mexican identity, portraying him seated in an equipal (reed chair) and wearing a boldly colored Zacatecan serape. Yet Rivera adorned his friend in a matador's headdress and draped the serape over his arm like a cape, thus invoking bullfighting, synonymous with Spain. In so doing, the artist at once alludes to the new home Guzmán found there and engages a personal metaphor: Rivera wrote of Guzmán "plunging the knife into a bull," in reference to the writer's political activities and writings. Executed in the summer of 1915 at the height of the Mexican Revolution, Zapatista Landscape illustrates the increasing politicization of Rivera's work. The depicted objects (sombrero, serape, rifle, and cartridge belt), placed before the mountains of the Valley of Mexico, evoke the peasant revolution. This amalgamation of still-life and landscape genres is, above all, a symbolic portrait of Mexico. Indeed, its more specific title was acquired later. Rivera would state that his so-called "Mexican trophy" was "probably the most faithful expression of the Mexican mood that I have ever achieved." Though he ultimately produced nearly two hundred cubist works, Rivera would not duplicate the overt nationalism of Zapatista Landscape. Instead, his cubist style became increasingly austere and accordingly less political over the next several years. By 1918 Rivera had left Montparnasse and abandoned cubism altogether. But his paintings of 1913 to 1915 remain an important legacy of both his singular approach to the idiom of cubism and the awakening of his political sensibility and emergent Mexican nationalism. The works function as records of the artist's exploration of the conjunction between history and personal experience. Following his return to Mexico in July 1921, he began producing work that attempted to define a new identity for the post-revolutionary nation. He wrote of wanting to create an art that would "help the masses to a better social organization." Rivera would work toward that goal with his politically committed, public murals, though he later attested to the Mexicanidad that suffused his cubist art, stating "My cubist paintings are my most Mexican." Overview: 20 cubist paintings and works on paper by Mexican artist Diego Rivera were presented in this exhibition that highlighted Rivera’s early cubist works produced between 1913 and 1915. The exhibition celebrated the acquisition of Rivera’s No. 9, Nature Morte Espagnole bequeathed to the National Gallery by Katharine Graham. The exhibition coincided with Courtly Art of the Ancient Maya and was part of ¡Viva Mexico! Washington, DC Celebrates, a citywide celebration of Mexican art and culture. Concerts in honor of the exhibition and Courtly Art of the Ancient Maya were presented on April 4 by Cuarteto de Cuerdas de Bellas Artes, the resident quartet of the Instituto de Bellas Artes in Mexico City, and on June 13 by the National Gallery Orchestra. 30 classic and contemporary Mexican films were presented in Milestones in Mexican Cinema: 1898-2004 from April 18 through July 10, 2004. The series was organized in association with the Instituto de México, the Mexican Film Institute, Secretariat for External Affairs, and the National Council for Art and Culture. Organization: The exhibition was organized by the National Gallery of Art, Washington, in collaboration with the Museo de Arte Moderno, Mexico City. Leah Dickerman, associate curator of modern and contemporary art at the National Gallery, was the curator, in consultation with Luis-Martín Lozano, director, Museo de Arte Moderno. Sponsor: The exhibition was sponsored by Target Stores. Brochure: The Cubist Paintings of Diego Rivera: Memory, Politics, Place, by Jessica Stewart with Leah Dickerman. Washington, DC: National Gallery of Art, 2004.